Loose stools is usually the first sign. Giardiasis (Giardia) lives in the intestines of infected Dogs. Dog's become infected by ingesting contaminated water, soil, or food. The infected animal passes the parasite through feces. The most common way a dog can get giardia is by drinking puddled water at parks, your own yard, ponds, lakes, swamps, and streams. Common animals that carry the microscopic organism are; dog's, cat's, beavers, muskrats, sheep, and cows. The symptoms appear 1-2 weeks after infection, but some dog's can be carriers and show no symptoms. This can result in dehydration, weight loss, and nutrition loss. The dog may need immediate veterinarian attention. The veterinarian checks a stool sample under a microscope. 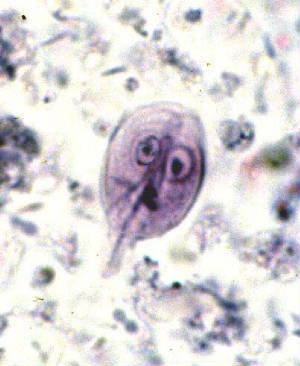 Giardia can be passed from animal to humans.